Fuss free effortlessness is not usually a trait one might attribute to French women. And yet the overriding trend to emerge from today's offerings is as intimidating as a seven step skincare regime. The theme was one of ‘young, cool French girls’ a mantra that was bandied about backstage more often than the models diet coke breaks (at Vanessa Bruno Lucia Pieroni instructed her team not to spend more that five minutes on each girl; amen to that I say!). Even at Roland Mouret where the reference was Catherine Deneuve in The Hunger, the 80s power pout was an uncomplicated slick of red gloss for a modern take on the classic Robert Palmer-esque look. Hair seemed to follow suit with an easy breezy ‘naturally good hair’ texture which was spied at both Isabel Marant thanks to Paul Hanlon and Vanessa Bruno by way of Eugene Souliman and a bit of help from Wella’s Ocean Spritz (THE product of the season). 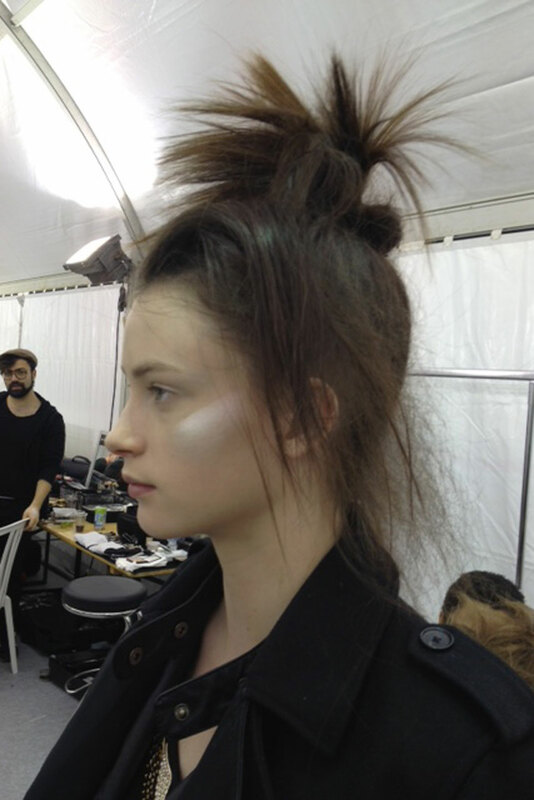 The only exception to the rule was the hair at Issey Miyake which although designed to look as though the models had fallen from the stratosphere, it was in fact what Wella Creative Director Eugene dubbed ‘organised chaos’ with a good deal of arm work involved to create the airy, ethereal texture (and more Ocean Spritz action).